Wollongong City Council staff Wayne Cowling and Peter Carni, with the Blitz at the Wollongong Central Depot. ONE of Wollongong City Council’s oldest workers will retire this month. The Blitz, a 70-year-old GMC truck, will retire to the Australian Road Transport Heritage Centre. ‘The Blitz’, as the work crews call her, dates from 1942. 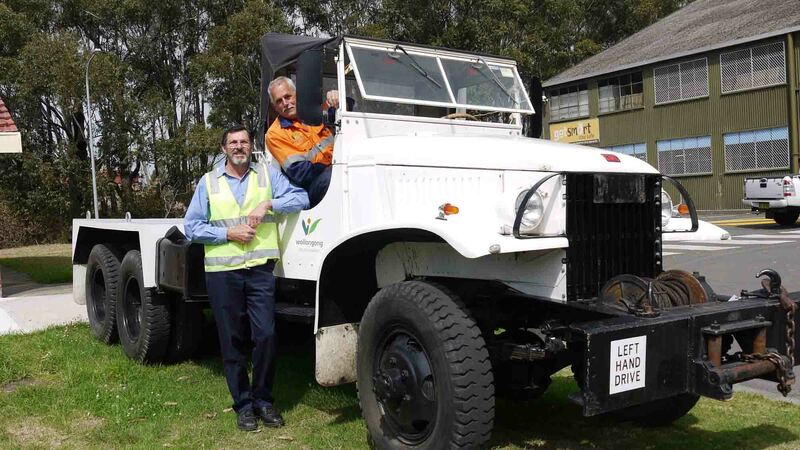 Council purchased the truck some decades ago and since then the truck has completed numerous tasks, most notably as a tow truck and in the recovery of plant items such as the backhoe, graders, excavators or tractors that were bogged or broken down. Council’s City Wide Services Manager John Bubb said its most notable use came when it featured in the Moomba Festival in the early 1980s as a float. “The Blitz has also featured in recent Camp Quality Convoys,” Mr Bubb said. Council is providing the old workhorse free to the museum on the proviso that it be on display in the news centre in Tarcutta, NSW.